The strength of an anthology stems from both the writers and the editor. This is especially true when the stories have a common core such as this one: life on the new frontier of Mars. This anthology succeeds extremely well, thanks to the variety and intermingling of themes and perspectives, which makes the most of the excellent writing. Writers from multiple countries, backgrounds, and genre provide 12 stories that bend the imagination and thought processes of the reader, and “bend” is the appropriate verb. Molding would imply that there was consistency of theme or intent on the part of the editor. Bend is the correct description. Strahan, an experienced and celebrated Australian writer and editor, has arranged these stories such that the reader is catapulted from one perspective to the next, not gently transported. Some may find the changes in gear ratio and style a bit too abrupt; personally, I prefer it. 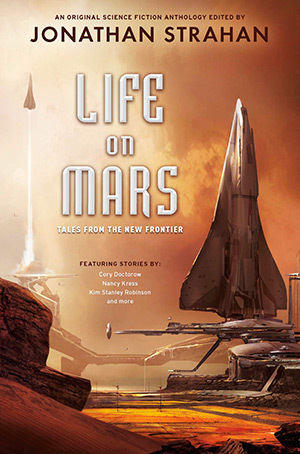 Kim Stanley Robinson rounds out the dozen with “Discovering Life,” a short, tongue-in-cheek look at how discovering any form of life on Mars may complicate things. Life on Mars is classified on Amazon as age 12+ and Young Adult, but most of the stories have themes and underlying messages that will provoke thought at any age. I thoroughly enjoyed this anthology.